With research as one of its functions as an educational institution, the University of Saint Louis (USL) produced four researches published in refereed print and online journals during the second semester and the short term. The papers dwell on business education, health, mathematics education, and librarianship. 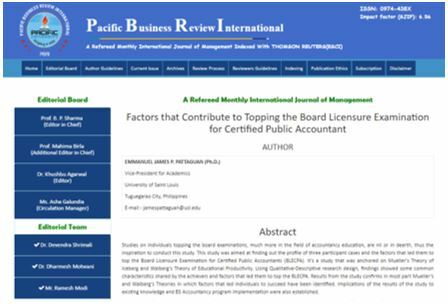 “Factors that Contribute to Topping the Licensure Examination for Certified Public Accountants” by Dr. Emmanuel James P. Pattaguan, was published in an ESCI (Emerging Sources Citation Index) Journal, the Pacific Business Review International, March 2018 issue. Personal factors such as good study habits, strong faith in God, being consistent academically, determination, and positive outlook in life, represent the internal environment that plays a major role in the achievement of the topnotch graduates. School, home and peer factors, which constitute the external environment, likewise are contributory, the study found out. The study used qualitative-descriptive research method which sought to present and describe the participant cases based on their own accounts coupled with some validations from parents, teachers and classmates. The study made reference to Mueller’s Theory of Iceberg and Walberg’s Theory of Educational Productivity. 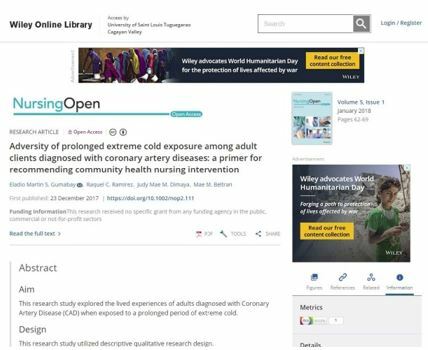 The health study, “Adversity of Prolonged Extreme Cold Exposure among Adult Clients Diagnosed with Coronary Artery Diseases: A Primer for Recommending Community Health Nursing Intervention” by Dr. Eladio Martin S. Gumabay, Raquel Ramirez, Judy Mae Dimaya, and Mae M. Beltran, was published in Nursing Open, another ESCI Journal, in its December 2017 issue. The study explored the lived experiences of adults diagnosed with Coronary Artery Disease (CAD) when exposed to a prolonged period of extreme cold. Manifestations of CAD are triggered when there is exposure to a prolonged period of extremely low environmental temperature, according to the study. Further, the study found the significance of a nursing health care for health promotion, disease prevention, and health restoration especially in community setting. The study used descriptive phenomenology, face-to-face interview sessions with 30 informants, audio recording, and Colaizzi’s method of data analysis. 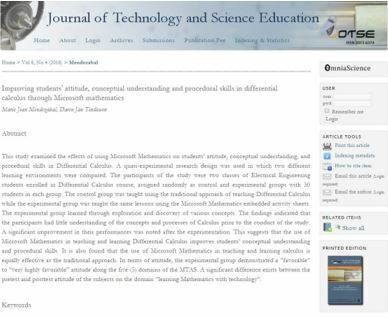 Dr. Marie Jean N. Mendezabal and Mr. Darin Jan C. Tindowen’s research: “Improving Students’ Attitude, Conceptual Understanding and Procedural Skills in Differential Calculus through Microsoft Mathematics” is published in the Scopus-indexed Journal of Technology and Science Education, Volume 8, Number 4, 2018. The paper was accepted for publication in April this year. Using quasi-experimental research design in which two different learning environments were compared, the researchers noted that using Microsoft Mathematics in teaching and learning Calculus is equally effective as the traditional approach, which was used for the control group. 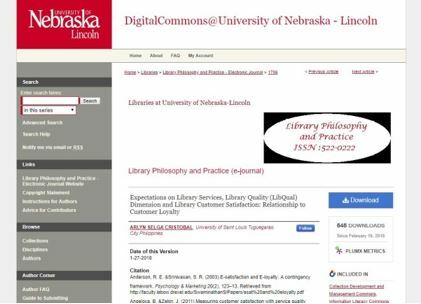 “Expectations on Library Services, Library Quality (LibQual) Dimension and Library Customer Satisfaction: Relationship to Customer Loyalty” by Mrs. Arlyn Cristobal appears in the Library Philosophy and Practice (e-journal), also a Scopus-indexed journal, January 2018 version. The College Library customers’ minimal and desired expectations were compared with the library’s actual observed service performance. Correlatively, there is a significant direct relationship between the USL College Library service quality and customers’ satisfaction. Customers’ satisfaction is directly correlated with their loyalty towards the USL College Library and its services. The study used a questionnaire based on (a) the LIbQUAL™ 2003 by the Academic and Research Libraries (ARL) and Texas A&M University Libraries; (b) satisfaction on library services; and (c) loyalty measures. It was distributed to 400 library users. ESCI and Scopus-indexed journals are databases of “high quality” refereed journals used as references for researchers across the globe. Dr. Pattaguan is the VP for Academics; Dr. Gumabay, head of the Center for Health Research and Development (CHRD), was co-researcher with his MS Nursing students; Dr. Mendezabal is director of the Institutional Research and Publication Office (IRPO); Mr. Tindowen is head of the Center for Social Innovation, Local Knowledge, and Educational Research (CSILKER); and Mrs. Arlyn Cristobal is head librarian of the Elementary department.